The church building in Peredo doesn't look like anything special on the outside. When my dad first saw it, he compared it to a tobacco barn. The walls are open, made with slates of wood. This provides the much needed breeze during the hot church services and during school. When the people sing the neighborhood and people walking by can hear well through these walls. Roro's truck is the only vehicle ever parked out front. The congregation walks to church. None of them have vehicles of their own. The building has multiple purposes and uses. This building is where mobile clinics are held and where school for 57 children is held too. The building is transformed into a school for 3 grades during the week. Large chalkboards are used to separate the rooms. With all the openness and noise audible from the other classes, i don't know how the students concentrate on their class. But they do! The plan is to build a school on this property in the future. Thank God he provided a church building for the kids to use for now. 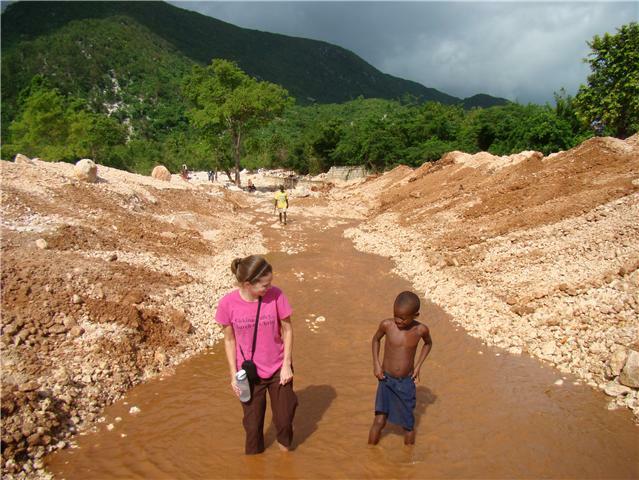 Haitian Christian Outreach saw the need for a school in this community and they didn't wait for the funds for a building. They opened the church to the kid in the community whose parents couldn't afford to send them to school. N ap cheche pou dlo-We are looking for water!